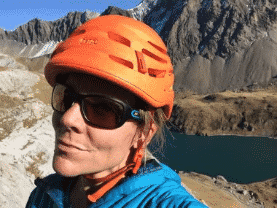 Join IFMGA/UIAGM mountain guide Caroline on a unique 2-day ice-climbing course in the stunning Cogne town in the Aosta Valley in Italy! Cogne is an adorable town in the Aosta Valley. 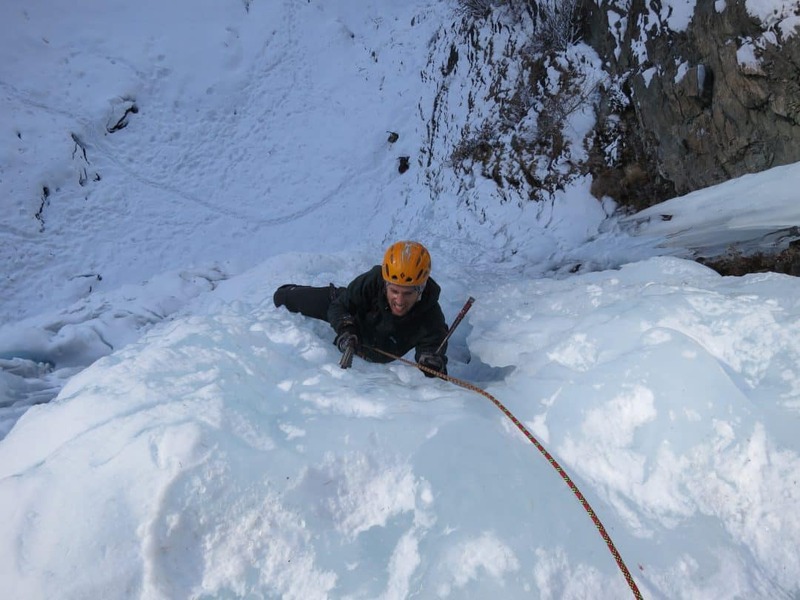 Close to Chamonix and Martigny, it is the perfect winter destination for ice-climbing. 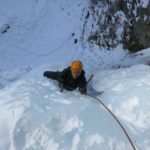 On this 2-day ice climbing course, we show you the ropes to this exhilarating sport and give you the chance to put it to practice the the beautiful Cogne setting! We begin on day one with an introduction to ropes and basic climbing techniques. We will also cover topics such as safety, and show you how to climb both single and multi pitch climbs! Multi pitch climbs involve stops on the way up which require special techniques. Then, on the second day, you will get to put your newly acquired skills to practice! We will head to one of the stunning multi pitch climbs in the region and try an exhilarating ascent! The course is suitable for all levels and we do not require previous climbing experience. We will have a 2:1 guide ratio, so attention will always be very personalised. We do however recommend you sign up with a friend unless you want to do a private trip. This is because we try to work with similar level groups to optimize the experience. The course also includes lodging with dinner and breakfast. Also, Cogne has some beautiful scenery to complement the adventure so you will get both an exhilarating and educational experience and a treat for the eyes! Want to learn something out of the ordinary this 2018? Then book your place now for this 2-day ice climbing course in Cogne and start the year off on a thrilling adventure! Once you tackle the ice, you’re bound to tackle anything! Those that like off-piste skiing will also enjoy our week long excursion in Verbier, Switzerland! Price is per person based on a 2:1 guide ratio. Transportation costs, one night lodging with breakfast and dinner, technical gear (axes, harness, crampons, helmet, belay device) and all the guides expenses. On day one, we will cover the necessary knowledge and techniques to start ice-climbing. In the evening we will enjoy a hearty dinner at the hotel. After breakfast, we will ascend a multi pitch ice climb! One night lodging with breakfast and dinner. I was born in a small ski village in the Swiss Alps and was immersed in the climbing culture through my parents at a young age. After three years competing in the ice climbing world cup and after graduating from law school, I decided to pursue climbing professionally, both as a guide and as a professional alpinist. My passion for everything relating to the mountains - alpine climbing, ice climbing, skiing, skimo races, rock climbing, etc. - has taken me all over the world, doing first ascents and repeated beautiful climbs in places such as Canada, Ethiopia, Norway, Jordan, Iceland, Antarctica, Morocco, Thailand and more. But some of my greatest climbs have been here in the Alps, climbing the north faces of the Eiger, Matterhorn, Grandes Jorasses and Drus, or Beyond Good and Evil in Chamonix. What I love most though is climbing big frozen waterfalls. Through guiding, I get to share my love for the mountains, as well as my skills and knowledge with guests around the world, in the alpine, on ice, rock or on skis. What I love about my job in the Alps is that I get to speak so many different languages - English, French, Italian, German - as the mountains sit on or close to borders. The mountains are my passion and have been my way of life for most of my life. It is a community I am proud to belong to. And on this journey, I have met my husband and fellow mountain guide, Adam. We love working together. We live in Finhaut - a small Swiss village right the French-Swiss border between Chamonix and Verbier - with our lovely daughter Olivia. We have access to beautiful climbing and ski touring right from our doorstep and are close to world class terrain in France, Switzerland and Italy in a matter of minutes! When I am not guiding, I play for myself in the mountains, work on translations, blog and love to rediscover the wonders of the world through the eyes of my daughter.